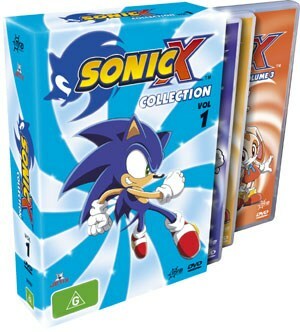 Collecting the first three discs in the Sonic X storyline, we once again team up with the world’s most famous hedgehog and his friends in more zany adventures. For those who had their head in the sand, Sonic debuted many many years ago as a video game from Sega and Sonic titles still thrill gamers today with fantastic new games in the market place for next generation consoles. In this series, Sonic and all the creatures from the Sonic universe are transported to an alternate world where Sonic must beat the Evil Dr. Eggman and his robot army to collect all the Chaos Gems before they can be used for Eggman’s evil schemes. Despite all the fluff surrounding the series, that is what is boils down to: Sonic needs to get the gems before Eggman or all is lost. In this world, Sonic finds a friend in the young human Christopher who tries to help the Sonic team in their quest to keep the peace. There are some quite amusing points in the series and there is always a sense of morality in place. The kids should love this series, it’s fast paced with bright and colourful characters, and even fans of the game should enjoy seeing their video game heroes (and villains) brought to life. I WANT TO BE RESPECTED! For some light hearted fun, you don’t need to look much further than this set of discs that should keep the young ones busy for a few hours at least.